Blizzard should rework on their basic cards. This thing has always been weak, sadly. Boulderfist has one less attack for one less mana, while this thing sports no keywords. This could easily have been an 8/7 or a 7/8. Vastly outdone by todays standards and Dr. Boom kicked hin out of any deck back in the day too. No, like seriously look at it, it's awesome. 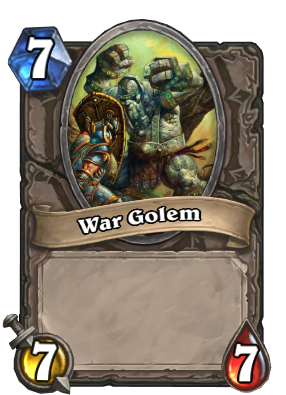 Goodbye Dr. Boom, HELLO WAR GOLEM WELCOME TO MY 7 MANA SLOT! Forget Dr.Boom I use War Golem and two Wisps. Careful what you say. Dr. Boom users are very self conscious, they don't have very high self esteem. Or they realized that War Golems in WoW are essentially animated stone statues, not machines (and are classified as elementals, not mechanical). Hence why fear works on them (it doesn't work on mechanicals), as referenced in the flavor text. Wish this big guy was at least made into a mech in GvG so Dr. Boom wouldn't power creep him. Oh well. Actually the flavour text is quite questionable, because mechanics creatures are strictly immune to fear in many early versions of World of Warcraft. It was not until very late that fear became ubiquitously effective and ominous. This card alone is a simple 'triple seven' lucky strike. It is the so-called strongest free neutral minion, but one always prefers Boulderfist Ogre. This card is subject to Big Game Hunter for its 7-attack, and its stats are just terrible for the cost. This card is not bad, per se, as a 7/7 for 7 mana is about average. It's only really considered bad because it's existence is invalidated by the existence of Boulderfist Ogre. These golems are elementals in WoW, not mechanical. They are magically animated stone, not machines. ::waves hand:: There is no fear spell.